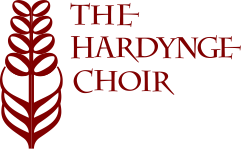 Hardynge Choir was formed in 1966 as an evening class, and David Ireson was its principal conductor for twenty five years. Rogers Covey-Crump was the first accompanist for the choir and later became a world renowned tenor. Other well known musical names associated with the choir were Peter Dyke, now Assistant Organist of Hereford Cathedral, and Andrew Parnell. Roderick McPhee was the Music Director from 1992 to 2006, and during his tenure stretched the choir with a wide variety of challenging yet enjoyable works. It was very pleasing that his wife, Louise Hemmings, was the superb soprano soloist in many of our works. In 2000 Rod was the General Manager of the Monteverdi Choir and managed John Elliot Gardiner's epic Bach Cantata Pilgrimage. During that time we were very fortunate to be directed by Terence Charlston, Professor at the Royal Academy of Music, and a world renowned performer of early keyboard music. He directed a superb performance in English of St John's Passion, in which both Rod McPhee and Louise Hemmings were soloists. Rod's tenure as Music Director came to a climax in 2006, which also happened to be the 40th Anniversary Year of the choir. The year was marked with two special concerts. Firstly we gave the premier performance of a specially commissioned work, Magnificat, by Philip Tebbs, under the Adopt-a-Composer scheme, funded by the PRS for Music Foundation and administered by Making Music. The year ended on a high with a glorious performance of Handel’s Messiah (complete) in St Albans Abbey, and we were delighted that our first accompanist, Rogers Covey-Crump, sang the Tenor solo. Catherine Beddison was appointed in January 2007 and opened her tenure as Music Director with an exciting performance of Karl Jenkins’ The Armed Man. Catherine continued to stretch and challenge the choir, but accepted another day job elsewhere, and left in June 2010. Mark Jordan did an excellent job as Interim Music Director during the interregnum. In the Christmas Concert we sang The Manchester Carols by Sasha Johnson Manning. Rufus Frowde joined us as new Musical Director in May 2011, and opened his tenure with the choir with a magnificent performance of Mendelssohn’s Elijah at a St Albans St Cecilia Society Concert in St Albans Abbey on 22 October 2011. In 2012 Hardynge Choir gave the first performance of The Hardynge Seasons, a delightful work specially written for us by Sasha Johnson Manning. Hardynge Choir were greatly honoured that Sasha Johnson Manning agreed to be our first Honorary President. In 2016, we celebrated our 50th Anniversary year, with a glorious performance of Haydn’s The Creation just before Easter, followed by a jazz inspired concert in the summer, which included Duke Ellington’s Sacred Concert. The year ended on a high with a performance of Britten’s St Nicolas Cantata, in St Nicholas Church, and the first performance of Ring Out, Wild Bells, a new work that our Honorary President, Sasha Johnson Manning, had written for us.